Note: Report approved by Board of Review May 11, 2005. The title page and pages 24-29 were publicly released August 3, 2005. 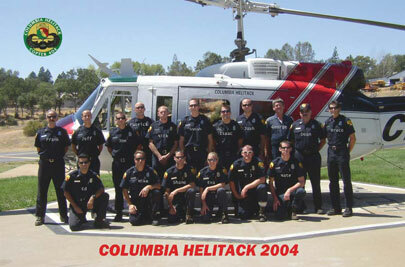 On September 12, 2004 at approximately 1345 hours seven members of California Department of Forestry and Fire Protection (CDF) Columbia Helitack (Copter 404) crew had to take emergency action when a sudden wind shift and fire flareup overran their position. The helitack crew was constructing handline during the initial phases of a fire. The crew members saw the wind shift occurring and immediately utilized their escape routes to the identified safety zones. However, due to steepness of slope and rapid change in fire behavior, they did not all reach safety. Three firefighters suffered minor injuries and Firefighter Eva Schicke was entrapped and killed. The fire was located at the bottom of the Tuolumne River Canyon on the Stanislaus National Forest(STF). The Tuolumne River Canyon is a major Sierra Nevada river drainage that has steep canyon sides and is 2,000 feet deep at the accident site. Slopes range from 80 to 120 percent. The fire was burning in predominately live oak leaf litter, light grass and mixed brush, with an oak overstory consistent with Fuel Model 2. One-hour fine dead fuel moisture was estimated at four to five percent and live fuel moistures were at critical stage. No critical fire weather patterns (thunderstorms, frontal passage, etc.) were in place. The fire was located just above the river in the bottom of the Tuolumne River Canyon near Lumsden Bridge. Lumsden Road runs parallel to the river. The fire was backing down-slope below the road and spreading rapidly above the road, up the south canyon face. At 1259 hours Air Attack 440 (Battalion Chief Dan Ward and Pilot Colin Rogers) arrived at the scene. Ward was designated as Tuolumne Air Tactical Group Supervisor (ATGS). The fire had burned five to ten acres and was spreading up-slope and up-canyon pushed by a steady 3-5 mph up-canyon wind. ATGS Ward directed the two air tankers to make retardant drops on the right flank on the upper section of the fire. They were unable to get lower on the slope due to the canyon’s steepness. Copter 404 arrived at the scene at approximately 1305 hours. After waiting for the air tankers to clear, HC Winger and the six firefighters were dropped off by Copter 404 on a gravel bar at the confluence of the South Fork of the Tuolumne River and the Tuolumne River, approximately ¾ mile downstream of the fire. They walked from their landing zone to Lumsden Road near South Fork Campground and then toward the right flank of the fire. They were the first ground resources to take action on the fire. ATGS Ward directed Copter 404 to make water drops on the right flank of the fire starting at the bottom. Copter 404 began their water drops at Lumsden Road and worked their way up the right flank. Copter 404 did not make any water drops on the fire below Lumsden Road (between the road and river). STF Division Chief Johnson was dispatched to the fire as the Incident Commander (IC) and responded down Lumsden Road from the Buck Meadows area. The IC drove past Helitack Crew 404 walking on Lumsden Road near South Fork Campground while he was en route to scout out the fire. He observed that the fire was both above and below Lumsden Road. The right flank of the fire below the road was backing very slowly into the wind. After observing the fire area near the right flank he returned to where the helitack crew was walking toward the fire. HC Winger met with IC Johnson. IC Johnson told HC Winger that he had just driven to the right flank and described the fire situation that he had observed. IC Johnson gave HC Winger the strategic assignment to size things up to see if there was some place they could anchor the fire to the river. HC Winger later stated that he understood his instructions to be to “anchor the fire on the right flank, from the road down to the river.” No specific tactics were discussed. Following the briefing, HC Winger and the crew continued to walk along Lumsden Road to the right flank of the fire. The IC did not identify or discuss any overall strategy or priorities for the incident with the ATGS or the Helitack Captain. After the briefing with Helitack Crew 404, IC Johnson initiated a discussion with the ATGS about using the copter to anchor the fire at the river. The ATGS said that his priority was further up the right flank and the IC concurred with this recommendation. HC Winger heard this discussion on the tactical net and realized that the priority for water drops from Copter 404 was going to be above the road. At approximately 1335 hours, upon reaching the right flank, FF Boatman and FF Neveau scouted further up Lumsden Road to see how far they were from Lumsden Bridge. They thought the bridge was another one to two miles further up river and would not work. Their intent was to determine if they could access the river and work their way into the bottom of the fire. The slope between the road and the river was very steep (80 to 120%) with smoke obscuring any access to the river through the burn. HC Winger scouted out a grassy opening, through the green, in the oak overstory near the fire’s right flank where he could see to the river. The fuel type was grass, leaf litter and scattered light brush under an oak and pine overstory. He scouted down the right flank (about 70 feet) to a point where he could see the route for line construction to the high water mark of the river. HC Winger estimated this would require 250 to 300 feet of fireline to be constructed from the road to the rocks above the river. The right flank of the fire, below the road, was generally backing very slowly cross-slope into a steady, light up-canyon wind with surface flame lengths of 6 to 12 inches. The firefighters observed a surface fire burning underneath scattered brush without igniting the aerial portion of the brush. While HC Winger and Helitack Crew 404 assessed their tactics for the right flank of the fire; STF Engine 43 (E-43) arrived at IC Johnson’s location on Lumsden Road near South Fork Campground. STF E-43 Captain Mount received a briefing from IC Johnson and instructions to spot their engine at the Drew Creek crossing and support the helitack crew on the right flank. Neither IC Johnson, nor STF E-43 Captain Mount notified HC Winger that the engine was in the area or assigned to support them. HC Winger made the determination that constructing a scratch line from the road downhill to the river would be simple and quick to accomplish. His plan was to construct indirect line closely parallel to the fire edge and then cut off the underslung portion by dropping straight down to the river while firing out the intervening fuel from the road downhill as they constructed line. The tactic was selected so that the crew could stay out of heat and smoke and take advantage of sparse fuel and natural barriers. Their five backpack pumps were staged on the edge of the road. The crew began to construct line downhill from the road to the rocks above the river (slope distance of 180 feet). The specific fireline construction assignment was to start with the chainsaw to take out the scattered brush, followed by anchoring at the road using scraping tools to cut a quick indirect scratch line, paralleling the fire’s edge. They began to fire-out the intervening fuel as they went down the slope. All members of the helitack crew stated that they understood the assignment, had opportunity to comment, raise concerns, or even veto the assignment if they believed it to be unsafe. No one raised concerns. HC Winger identified the escape routes and safety zones to all of the crew members. HC Winger notified Copter 404 (on the assigned tactical net) they would be constructing downhill line on the right flank to tie into the river. At approximately 1340 hours the crew members began building handline downhill. FF Fraser and FF Agustin had reached a point approximately 2/3 of the way down the slope (roughly 30 feet above the rocks at the high water level of the river) and were running out of brush to cut with the chainsaw. HC Winger and FF Andahl had cut a scratch line below a rocky outcropping, 80 to 100 feet down slope from the road. FF Schicke and FF Boatman were improving the scratch line and FF Neveau was using a fusee to burn out the intervening fuel starting at the road. FF Neveau had fired from the road to FF Schicke’s position, 25 to 35 feet below the road. The firing operation was “pulling into the fire’s edge nicely.” Captain Winger addressed the three upper firefighters (Schicke, Neveau and Boatman) for one of them to return to the road, use a back pump to hold the anchor and be a lookout. FF Boatman volunteered to take this assignment and returned the 35 feet up the fireline to the road. At approximately 1346 hours, as FF Boatman was preparing to don the back pump, STF E-43 Captain Mount and STF E-43 FF Austin walked up to his location and asked where his Captain was. FF Boatman indicated down the hill and STF E-43 Captain Mount saw HC Winger’s red helmet and the crew building line. This was the first that anyone from the helitack crew knew there was other fire fighting resources in their area. During the conversation between FF Boatman and Captain Mount, a sudden wind shift occurred causing the fire to change direction and spread up-slope toward the crew. The fire reacted to the directional wind shift and the backing fire became a spreading fire that turned up-slope with the wind. The fire rate of spread and flame lengths increased dramatically. Three members of the helitack crew simultaneously shouted the alarm within seconds of the wind shift and everyone started toward their identified safety zones. The captain and three firefighters went down to the river; two firefighters went up toward Lumsden Road, FF Boatman was already on the road. The captain and three firefighters that went downhill reached their safety zone. Both FF Schicke and FF Neveau went uphill but only FF Neveau made it to the road. FF Schicke was last seen by FF Neveau immediately behind him approximately 5 feet from the road. FF Schicke was overrun by the flame front that was spreading uphill and was killed by inhalation of super heated air; she died within seconds. Her body slid down the slope and came to rest approximately 100 feet down-slope from the road. Firefighters at scene estimated the elapsed time from the wind shift to the burnover was less than 30 seconds with the total wind event lasting less than 2 minutes. Fire shelters were not deployed. Immediately following the burnover and escape to the safety zones, HC Winger announced over the tactical net that Helitack Crew 404 had been burned over and there were injuries. HC Winger asked ATGS Ward for immediate assistance with water drops. HC Winger identified FF Agustin, FF Andahl and FF Fraser along the river and contacted FF Neveau by radio to do a crew accountability check. FF Neveau contacted HC Winger on portable radio and stated that FF Boatman and FF Neveau were accounted for but FF Schicke was missing. Copter 404 Captain Podesta heard HC Winger’s emergency announcement on the tactical net. Copter 404 was working a spot fire on the left flank at the time of the emergency call; they left the spot fire and proceeded towards Helitack Crew 404. En route they picked up a load of water from a dipping spot near Lumsden Bridge. They arrived at the crew’s location within 1-2 minutes, but the fire had returned to a backing fire with minimal activity as observed earlier. They made water drops to cool off the area. Searches for FF Schicke were started from the river up and from the road down. FF Boatman and FF Neveau located FF Schicke’s body approximately 100 feet below the road. HC Winger, a licensed paramedic, determined that she was deceased. CDF Engines 4490 (Captain Yount) and 4476 (Engineer Craddock) arrived at the accident site and assisted in treating the injured crew members, including bringing FF Andahl up from the river. IC Johnson transported the surviving members of the crew to South Fork Campground. They were transported by USFS helicopter to Pine Mountain Airport near Groveland. Two firefighters were then transported to hospitals via air ambulance. The remaining four firefighters were transported to hospitals via ground ambulance. HC Winger and the four firefighters taken to Sonora Regional Medical Center were treated and released by 1830 hours, September 12. FF Neveau was admitted to Doctor’s Hospital in Modesto, held overnight and released on September 13. Immediately after the accident was reported a joint CDF and USFS Major Accident Investigation Team was formed. The team convened in Sonora on September 13 and over the next several weeks did a comprehensive investigation into the facts and circumstances of the accident. A causal factor is any behavior, condition, act or omission that starts or sustains an accident occurrence. There were five (5) causal factors identified by the Accident Investigation Team. The wind shift changed the fire environment resulting in increased fire intensity and rate of spread. Unburned fuel between the fireline and the fire’s edge did not allow for a sufficient margin of safety. Escape routes were inadequate to allow sufficient time for the firefighters to reach safety zones. The steepness of terrain and difficulty of travel influenced the tactical decisions to access and anchor the right flank. The crew determined that safe access to the bottom of the fire was not possible via the river or down the slope either through the burn or the green. This conclusion influenced their decision to utilize the downhill line construction tactic in lieu of uphill line construction. Inadequate consideration was given to the difficulty of travel back up the steep slope and the effect of degradation of surface traction caused by fire line construction and firefighters walking on the loose soils on the slope. Helicopter water drops were available but not used. Fire engine hose-lay support was an option readily available but unknown to the helitack crew captain. A contributory factor is any behavior, condition, act or omission that affected the occurrence or outcome but was not causal. Avoiding or eliminating the contributory factor would not necessarily prevent the occurrence. There were six (6) contributory factors identified by the Accident Investigation Team. HC Winger had limited experience in indirect and downhill line construction. Incident actions were based more on current fire behavior and less on expected fire behavior. Downhill line construction has inherent dangers due to the nature of the tactic. There were incident command and control shortfalls. More thorough scouting prior to implementing downhill fireline construction could have led to utilization of a different tactic or withdrawal from the assignment. The safety zone in the black was not accessible. A lookout, with no collateral duties, should be posted when there is danger. USFS and CDF downhill line construction guidelines differ. The LCES Checklist differs between, and within, the two agencies, even in publications of the same year.